May 2013 be a wonderful year for you and your loved ones! We thank all of you for giving exposure to our artists all around the world: in the printed press, on broadcast radio and in podcasts, and in internet publications and blogs. And we thank you for including many of our releases and our artists in your Best of Year lists for 2012. We understand that you receive a lot of music, and we thank you for taking the time to listen to ours. Each year, we work hard to select for release, the best, most interesting and most provocative music that we can find, regardless of genre. While Cuneiform only releases 15 albums a year, we listen to a ton of music, including more than 150 demos received each month. 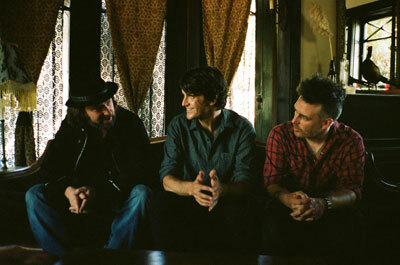 We hope that you're as excited about what we've chosen to release for 2013 as we are. 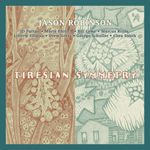 Cuneiform begins 2013 with 5 new instrumental rock and jazz releases that transcend geographic boundaries and genre walls. 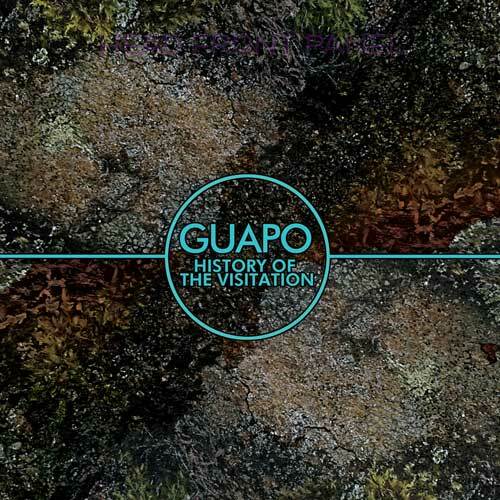 UK post-rockers Guapo bring us History of the Visitation, an enthralling and thrilling Avant Rock experience of near-religious magnitude, destined to incite conversion. 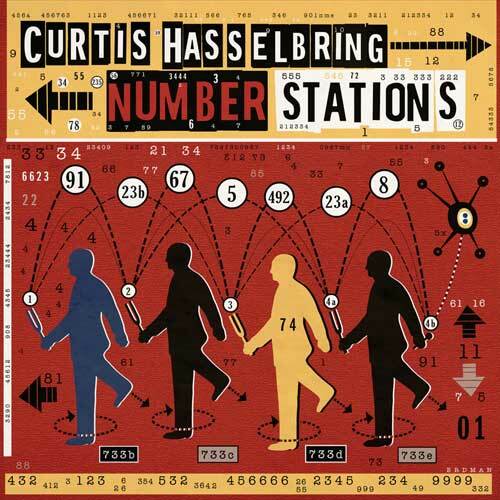 Subversion -- of rock and of jazz pretexts - is the subtext of Number Stations, featuring music to entice and intrigue by New York-based Curtis Hasselbring. 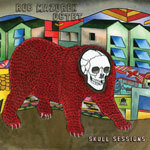 In Skull Sessions, artist extraordinaire Rob Mazurek - who shared the title of 2012's Artist of the Year with Wadada Leo Smith in Italy's Musica Jazz  brings together an Octet of cohorts from Chicago and Sao Paulo, Brazil to create a skull imploding, genre exploding album of psychedelic jazz. But there are even more ways to mix a jazz cocktail... Boundary-defying jazz is given a cosmopolitan transatlantic twist in Synesthesia by The Kandinsky Effect, a group based in NYC and Paris. 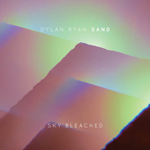 And in Sky Bleached, by Dylan Ryan's California-based Sand, it's infused with wide horizons and sun-drenched guitar. We invite you to explore the samples from our new releases provided below, and to ask us for promos for potential review. We are still shipping promos of former releases; thank you for your patience. And please keep your eyes open in the next two weeks for another email from Cuneiform, featuring upcoming label news, our 2012 in review  and obits for 3 beloved Cuneiform artists who passed away in 2012: John Tchicai, Lol Coxhill, Andrew Carrico. Our hearts go out to the families and friends of these three amazing saxophonists; may 2013 bring to all good memories and kinder days. 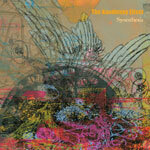 PROMO COPIES of Cuneiform's January 2013 RELEASES are NOW AVAILABLE for REQUEST. Both PHYSICAL CD and DIGITAL versions of our promos are available. CD promos are available to press and radio worldwide in limited numbers. Digital promos can be downloaded in several formats (lossless flac, mp3, aac, etc...), and are accompanied by album artwork, press releases, and artist promo photos. Please read through this email to find out WHAT new releases are available, WHEN they will be released and HOW to request them for possible review/airplay. We also have mp3s for which you can LISTEN / DOWNLOAD. If an outside / independent promoter is handling North American promotion for a particular album, we will immediately forward your request directly to him / her. Cuneiform is handling international promotion for all albums. [Click Here] to see our "Promo Request Procedures" or scroll down. Prepare yourself for an experience that’s simultaneously otherworldly and assaultive. 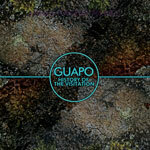 On paper, the music of Guapo reads like a riddle  the British quartet’s sound is based around ideas like controlled chaos, atonal harmony, uplifting darkness, and beautiful destruction. Nothing about the band or their work seems to adhere to even the most open-minded set of preconceptions about the meaning of umbrella terms like “rock,” or “progressive,” or even “experimental.” But when you abandon the need to reconcile any of these concepts with each other, and simply let their latest album, History Of The Visitation, speak for itself, everything becomes radiantly clear. 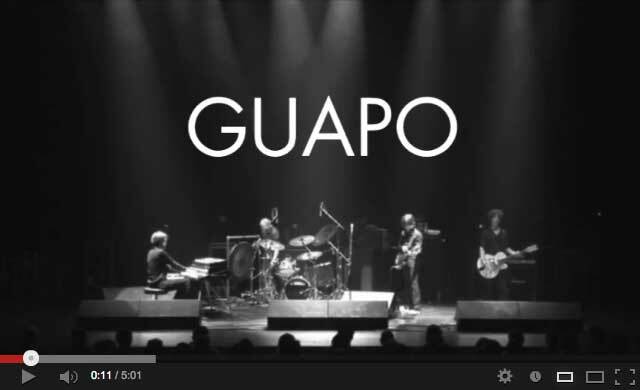 Over the course of the band’s 19-year history, fans and journalists alike have tossed a lot of comparisons in Guapo’s direction. Magma, The Ruins, King Crimson, Univers Zero, and many more names from the “progressive” and “Rock In Opposition” realms have been bandied about as reference points, and references to the likes of The Mars Volta or Boris wouldn’t be completely out of line either. And while elements of all of the above can be heard within the bold, bracing aural environs of History Of The Visitation, they only account for part of the story. Certainly the commonalities of the aforementioned artists  a tendency towards dark, moody, sometimes menacing musical colors and an abhorrence of all overt rock tropes  are crucial to Guapo’s m.o. as well. But History Of The Visitation can’t simply be considered the sum total of its most obvious influences. For one thing, the presence of reedmen Thomas Scott and Dave Newhouse from Maryland avant jazz-rock institution The Muffins among the album’s guest musicians should alert keen-minded listeners that the take-no-prisoners harmonic melee of modern jazz is among the sonic subtexts here. And the addition of strings, woodwind, and brass serves to underscore the orchestral side of what Guapo accomplishes in the sweep, scope, and near-symphonic grandeur of their extended compositions. In other words, when approaching HOTV, leave room in your mind’s eye for the image of Sun Ra jamming with Stravinsky. 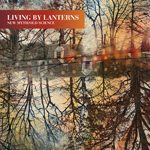 Both the CD and the limited-edition vinyl versions of the album come with a bonus DVD featuring a spellbinding performance of “Five Suns” filmed at NEARfest 2006 in Bethlehem, PA, and “King Lindorm” from the 2007 Rock In Opposition Festival in Carmaux, France. This is the only live footage of the band available to the public and features former member Daniel O'Sullivan of Ulver and Sun 0))). Mysterious coded messages float through the ether aimed at secret agents who, if they still exist, serve as pawns in a twilight struggle fought deep in the shadows. 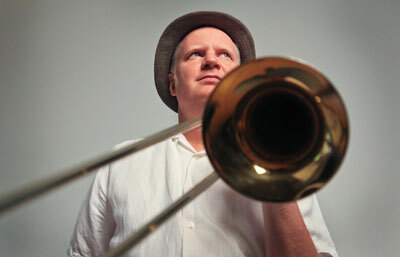 While this ominous phenomenon sounds like the plot of a new Thomas Pynchon novel, for the confoundingly creative New York trombonist/guitarist Curtis Hasselbring it’s the point of departure for his latest project. Inspired by the persistence of mysterious shortwave radio broadcasts that date back to the start of the Cold War, Number Stations is Hasselbring’s Cuneiform Records debut. 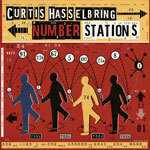 Number Stations serves as an apt topic for Hasselbring’s music, which combines propulsive grooves, dark humor, ambient spaciousness and highly choreographed ensemble passages. 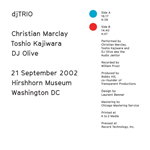 The album brings together Hasselbring’s two primary bands, the longstanding New Mellow Edwards with Chris Speed (tenor saxophone and clarinet), Trevor Dunn (basses) and Ches Smith (drums and marimba), and the more recent quartet Decoupage featuring guitarist Mary Halvorson, vibraphonist Matt Moran and percussionist Satoshi Takeishi. The highly unusual instrumentation is ideally suited for Hasselbring’s fascination with patterns that expand, contract and decay. In a sly echo of Spy Vs Spy skullduggery, Number Stations often plays elements of each ensemble against each other. He’s developed an open-ended concept that provides the musicians in this all-star ensemble information regarding their alliances, covert missions and espionage activities via composed music and improvisational stratagems. Nothing better illustrates the vaunted position Hasselbring occupies than his ability to corral so many brilliant and sought after players. More than a forum for his sly and slippery investigations into stripped down harmonic and melodic movements, the New Mellow Edwards has become a thriving conspiracy against musical clichés and tired jazz conventions. Your mission, should you choose to accept it, is to infiltrate this singular musical outpost and uncover the messages embedded in Number Stations. The bus is leaving for Bismarck. Have fun. Conceived on Paris’s cosmopolitan jazz scene, forged on the road in America, and informed by international currents in electronic music, The Kandinsky Effect is a jazz power trio for the 21st century. The trans-Atlantic band, based in New York City and Paris, makes its Cuneiform debut with Synesthesia, a roller-coaster ride of an album marked by fierce grooves, subtle electronic textures, intricate metrical shifts, and a commitment to empathic group interplay. 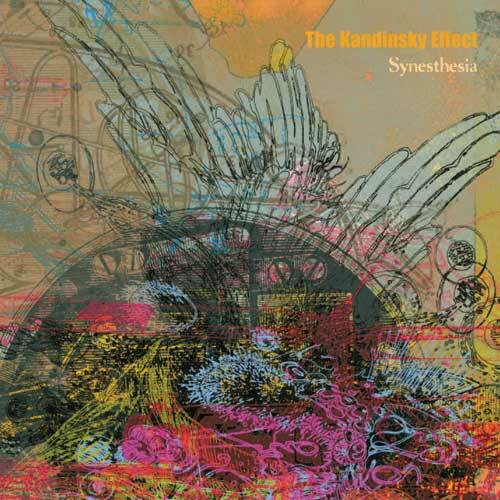 Featuring Warren Walker on saxophone and electronics, bassist Gaël Petrina, and drummer Caleb Dolister, The Kandinsky Effect explores a distinctive swath of sonic territory, inspired by similarly electronica-laced ensembles like Kneebody and Jaga Jazzist. With a long history as a cutting edge format, the saxophone, bass and drums trio is usually employed by horn players looking to explore harmonically unfettered improvisation. The Kandinsky Effect finds a different kind of freedom in the lack of a chordal instrument. The album opens with the rough and tumble “Johnny Utah,” which has little to do with Keanu Reeves’ surfer/FBI agent in the beloved 1991 film “Point Break,” except maybe a brooding sense of momentum, a relentless drive enhanced by clattering percussion breaks. Like several of Walker’s tunes “M.C.” moves sleekly through a series of sections, each built upon a different rhythmic theme or motif. In the same way, “Walking…” sounds more like a series of helter-skelter sprints over broken ground than a leisurely stroll. While the band excels at acceleration, The Kandinsky Effect also knows how to slow down, playing melodies that ooze and saunter. On Walker’s “Cusba,” the band displays a knack for mysterious balladry, with a coolly disquieting theme. The atmosphere gets thicker on “WK51” with the clattering march-time snare chatter building cinematic tension, the coiled calm before a deadly confrontation. The album closes with “If Only,” another ominously serpentine line with subtle layered effects that make it clear the trio has absorbed lessons from Bjork, Squarepusher, and Aphex Twin in developing a lapidary but spacious sound. Over dozens of shows performed in North America and Europe, the well-travelled trio of Walker, Petrina and Dolister had honed their collective sound to a fine polish. The transatlantic met in a studio mid-way between New York and Paris  in Rejkavik, Iceland!  to record their new album. 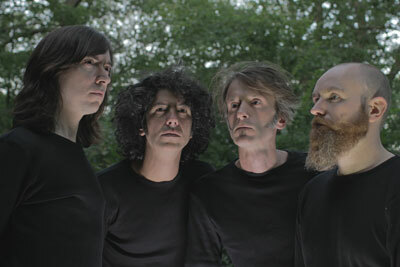 The result was Synesthesia, The Kandinsky Effect’s second release, and the group’s first recordings on American-based, internationally-distributed Cuneiform Records. Featuring 11 captivating tracks that are simultaneously rhythmically gorgeous, groove-laden, compositionally interesting and immediately accessible, Synesthesia promises to spread the sensory magic of The Kandinsky Effect’s transatlantic jazz worldwide. What does it sound like when worlds collide? 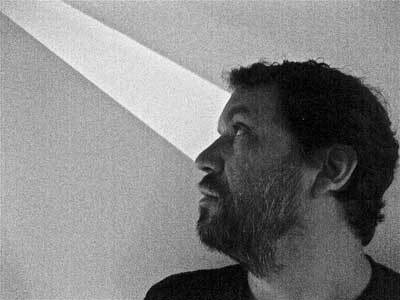 For the protean cornetist, composer, and conceptualist Rob Mazurek, the fusion of his celebrated Exploding Star Orchestra with his roiling Brazilian ensemble São Paulo Underground ignites a beautiful cosmic burst. Skull Sessions, the first release by the newly minted Rob Mazurek Octet, captures a series of shimmering, enveloping jazz soundscapes. Skull Sessions is composition and group improvisation as revelation, epic in scope, crackling with unexpected reactions and volatile collisions, charging the atmosphere like a thunderstorm that washes away all manner of sonic detritus. Cuneiform, the American label that also released Sao Paulo Underground’s most recent album, is releasing Skull Sessions in CD format and as a limited-edition, high quality vinyl pressing of 250 copies, which includes a digital download card. A force on Chicago’s singularly inventive sound scene for two decades, Mazurek is an intrepid sonic explorer eager to investigate new configurations. From his variable Chicago Underground units (duo, trio, quartet, and orchestra) to the Exploding Star Orchestra, Starlicker and the Pulsar Quartet, he’s mastered a protean approach in which his collaborators give substance to a composition’s form by creating layers of sound. 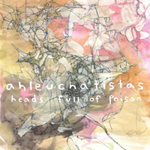 Lapidary and luxuriant, marked by an accretion of simultaneous lines and textures, Skull Sessions features an international cast of masters from North and South America, including drummer John Herndon, vibraphonist Jason Adasiewicz, flutist Nicole Mitchell, Guilherme Granado on keyboards and electronics, Carlos Issa on guitar and electronics, Mauricio Takara on percussion and cavaquinho (Brazilian ukulele), and Thomas Rohrer on C melody saxophone and rabeca (a rustic Brazilian viola associated with the northeast). The big bang that led to Skull Sessions detonated when the We Want Miles exhibition at SESC (Serviço Social do Comércio) São Paulo requested that Mazurek devise a presentation related to his deep affinity for the music of Miles Davis. In characteristic fashion, he decided against recreating any of Davis’s music, instead composing new pieces and rearranging earlier works for the Octet’s particular personalities and unusual timbres. 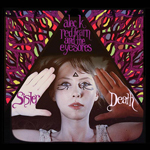 "I had the idea to write songs for a jazz band that had elements of Black Sabbath, the Cure, Jaco-era Joni Mitchell, and free jazz. I intentionally made the free playing and the composed sections less compartmentalized. The idea is to have a really great sounding rhythm section that can stretch out and make music spontaneously, and naturally together. Sand is a jazz band, but it reflects the different things I grew up on and listen to; It reflects the fact that I am playing jazz, but that I wasn't born in 1945."  Dylan Ryan. Featuring his volatile, Los Angeles-based trio Sand, Sky Bleached is Dylan Ryan’s debut album under his own name, but the insistently exploratory drummer isn’t a new face on the professional music soundstage. A bandstand veteran who’s spent the past decade collaborating with an array of galvanizing musicians across a wide array of creative scenes, he’s probably best known as the catalyst behind the pugnacious prog-jazz sextet Herculaneum. That’s likely to change with Cuneiform’s release of Sky Bleached, a stunning, guitar-drenched slab of visionary, 21st century jazz informed by pop culture and 3rd millennium fusion. A key force in the avant-rock project Icy Demons, and half of the psychedelic electronica power duo Michael Columbia, the Chicago-raised Ryan has also toured with Omaha indie rock legends Cursive and regularly works with Los Angeles electro-world-pop outfit Rainbow Arabia. Boasting a sonic vision that stretches to the far horizon, Sky Bleached draws on many of Ryan’s varied experiences, but Sand instantly establishes itself as wild and wooly creature in its own right. 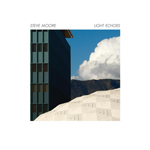 Featuring Los Angeles guitarist Tim Young, a versatile player sought out by artists such as Fiona Apple, John Zorn and Beck, and bassist Devin Hoff, a recent LA arrival who’s toured and recorded extensively with the Nels Cline Singers, Xiu Xiu, and Good For Cows, the LA-based trio restlessly ranges between moods, textures and styles. For Ryan, the project provided an ideal opportunity for exploring contrasting, even antithetical impulses, juxtaposing introspective odes with aggressive anthems, artfully composed passages and impromptu flights. 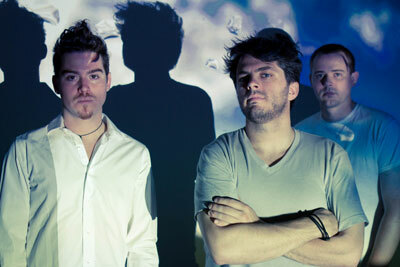 With their love of jazz, metal, indie pop and numerous other styles, Ryan, Hoff and Young draw on a vast shared sonic vocabulary in Sand. In creating a fertile environment for the trio, Ryan fully utilizes Hoff’s gift for melodic invention, and Young’s imperturbable rhythmic drive. Whether exploring a melancholy soundscape or an ecstatic rave up, Sky Bleached constantly subverts expectations with music that defies categories, and embraces all possibilities. NEW PROCEDURE: Javier and Joyce are both handling overseas radio promo. Please address all international radio to both Javier’s and Joyce’s email addresses. Physical CDs and Digital promos are available for all new releases released on CD. Please let us know if you PREFER DIGITAL PROMOS. If you request a digital promo, you’ll receive an invitation in your email box, telling you that you're selected to receive a digital CD. It will direct you to a digital promo site created for you personally to access downloadable files, press releases, as well as art work. Some of you may instead PREFER PHYSICAL CDS. Please note that we WILL CONTINUE to mail out physical CDs to a number of our contacts. We will take your preferences - digital vs physical - into account when shipping out promos, although we may not always be able to honor your requests. Please list your requests in order of PRIORITY, because we may not be able to give away as many promos as you request. Please understand that we have a limited number of promos, and that we can only give promos to a very limited number of blogs/webzines. Please also note that, at this point in time, we do not send physical promos (digital is fine though) to internet-only radio stations (of which there are thousands) unless they also operate a webzine etc. If you have an imminent DEADLINE and need promo CDs ASAP/IMMEDIATELY, please write *URGENT re New Releases* in the subject line of your email. If you have an URGENT request for a Deadline within the USA, please be sure to ask us to ship your package First Class or Priority. Otherwise, our Mail Room will automatically ship it 4th Class. Any emails marked URGENT will be opened the same day by myself or my assistant Javier. Due to the volume of email received, not all email is opened daily. PLEASE DO NOT use the word *URGENT* if you have a ROUTINE promo request. If you do not have an *URGENT* request, please be patient to receive promos of our new releases. After you email us, we log your request into our database. We are gradually implementing a new system, in which we can semi-automatically mail out promos in the order of need/urgency/publication date/ etc. BUT until that system is implemented, we usually do not ship out your promo request until sometime after your request, when we do a mass promo shipment to your country or region. Promo mailings are done by Javier and myself after reviewing more than 3,000 contacts worldwide, and often must be interrupted due to other pressing/deadline-oriented promo "emergencies". Because of high postage costs, we have been unable for some time to send physical CDs to many OVERSEAS WEBZINES, to some COUNTRIES/REGIONS that require us to use REGISTERED MAIL for security purposes, and to some COUNTRIES/REGIONS where postage is expensive and where we do not have formal DISTRIBUTION. For those who have not received physical CDs from us for such reasons, we are happy to announce a new PAID POSTAGE / PROMO CDS mailing procedure in collaboration with WAYSIDE MUSIC. 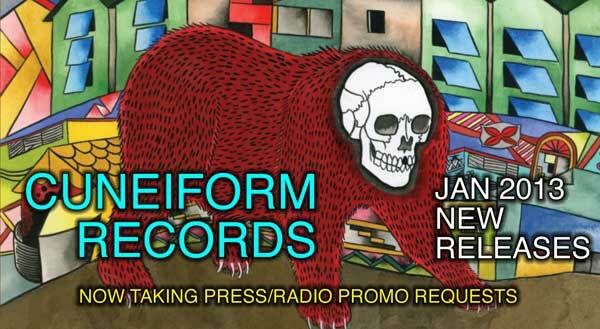 Under this plan, you request free promos of Cuneiform releases from me and Javier; Javier shows you how to pay Wayside Music for the postage (credit card or Paypal); and we ship the promo CDs to you. Please contact Javier and I to find out if you're eligible for this offer. Our Canadian distributor is also E-1. Press/Radio in most countries should contact me directly for promos. There are some exceptions; please look below to see if there are special procedures for your country. CUNEIFORM is now handling ALL radio and press promotion in CANADA. (3) Regardless of whom you receive promos from, please continue to inform me of press, radio play etc; thank you!!! We enjoy hearing from you and appreciate feedback. In addition, we keep comprehensive promotion archives for all of our artists and need to have copies of all reviews and other press. (3) Regardless of who you get your promos from, please stay in touch with us. We enjoy hearing from you and appreciate feedback on our releases etc. In addition, we keep comprehensive promotion archives for all of our artists and need to have copies of all reviews and other press.